Was a lovely stay - great location and super friendly staff - will definitely stay here again! Great location, great views, fabulous staff! Highly recommended. 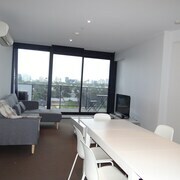 Close to everything in South Yarra Stayed for 2 nights - perfect location, really nice apartment. All that you need is 3 blocks away maximum. 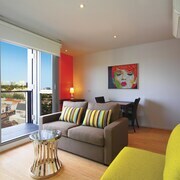 Apartment close to city in trendy South Yarra Asked for a room which was well lit and with view and was very happy! Excellent facilities, linen and modern amenities. Staff very obliging,helpful, friendly and professional. Close to city, trams, trains, shopping and restaurants. Great Location Really good location and great price, close to railway station and trams. Small boutique hotel, very personal service. Large bedroom and bathrooms. Nothing not to like. Close to cafes and restaurants, central Good, neat and what we needed as a group of 5 traveling over for a weekend wedding. Good facilities. Good price. Well located with easy access to trams and trains. Come down with a bad case of FOMO? 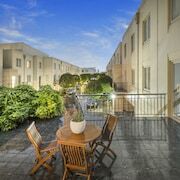 Spoil yourself with a getaway to South Yarra. 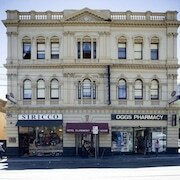 Located 4 kilometres from central Melbourne, it's a great place to stay while discovering Victoria's capital. There is no such thing as being bored in Melbourne. Tick off big-name sights like the Crown Casino and Entertainment Complex, Federation Square and St. Kilda Beach and make sure you humblebrag to your mates at home afterwards. Checking out South Yarra and its surrounds almost always involves going to the National Gallery of Victoria and the Royal Botanic Gardens. If you want to stay nearby after seeing the National Gallery of Victoria, the Crown Towers, Park Hyatt Melbourne, Grand Hyatt Melbourne, The Westin Melbourne and The Langham, Melbourne are all comfortable choices. For an enjoyable night out with friends, see what's on at Margaret Court Arena. 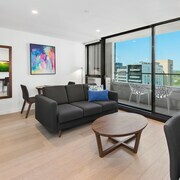 If you'd like to base yourself close by, two sweet choices are the Melbourne Short Stay Apartments MP Deluxe and Tribeca Serviced Apartments Melbourne. Watch an amazing live music performance at Sidney Myer Music Bowl. Don't forget to enquire about tickets and reservations. Need somewhere to tuck in around here? 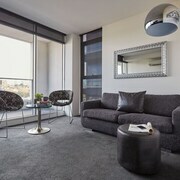 The Docklands Executive Apartments and Melbourne Short Stay Apartments are favourites with many visitors. If you get back home and you're not a little bit worried to check your bank balance, did you even have a holiday? The Amity South Yarra Apartments and Quest Prahran are worth considering if you don't mind throwing down a few extra notes. Keen to soak up the local café culture? Dive into a trashy mag, order a hot coffee and spoil yourself with some sweet treats at Cafe Republic. When you're after something heartier later, chow down on some grub at Wagyu Ya (Melbourne,South Yarra). Their delicious menu is bound to fill you up. You could stop there, but why would you? You're on holiday, right? At any rate, there's a vino waiting for you at Rah Bar! No worries if you can't secure the right hotel in South Yarra. You'll discover other places to crash out nearby. Chapel Street is about 0.7 kilometres from South Yarra, and Cremorne is 1 kilometre away. Whether you'd prefer your getaway in South Yarra to be laid-back or bursting with jaw-dropping moments, we'll be your guide! Just a couple more clicks and you'll be able to start packing your bags!